Mothers Day is coming soon. Looking through my art journals, I came across a page that I made a few years ago that I wanted to expand upon for this tutorial. 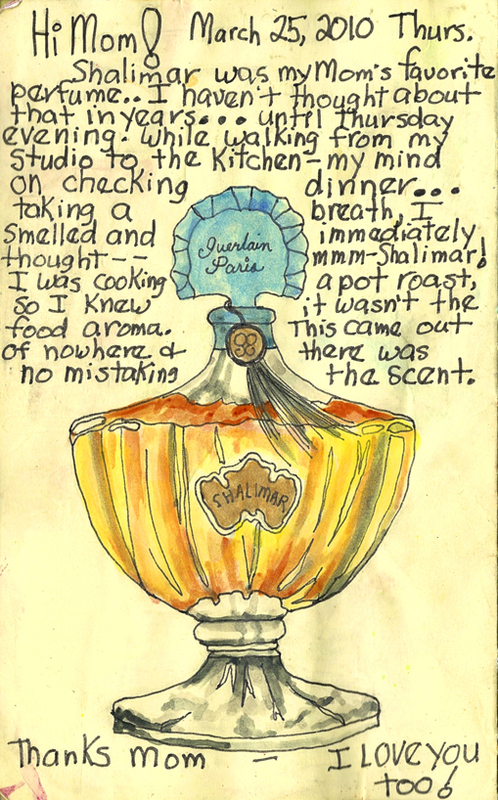 I wanted to create a scene that reminded me of my Mom’s true essence and her favorite perfume, Shalimar. As a child, I always loved to go into my Mom and Dad’s bedroom and look at what my Mom had on her dresser, bits and pieces of her life that she used and loved. 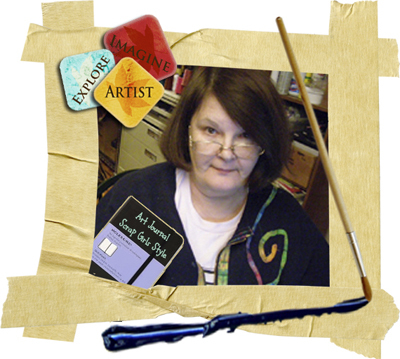 I opened a new document in my photo editing software, ( I used CS4) the size of my journal page. I then opened the dresser in ScrapSimple Embellishment Templates: Room Decor and duplicated all the layers, then brought them over to my document. I then sized to fit my journal page. 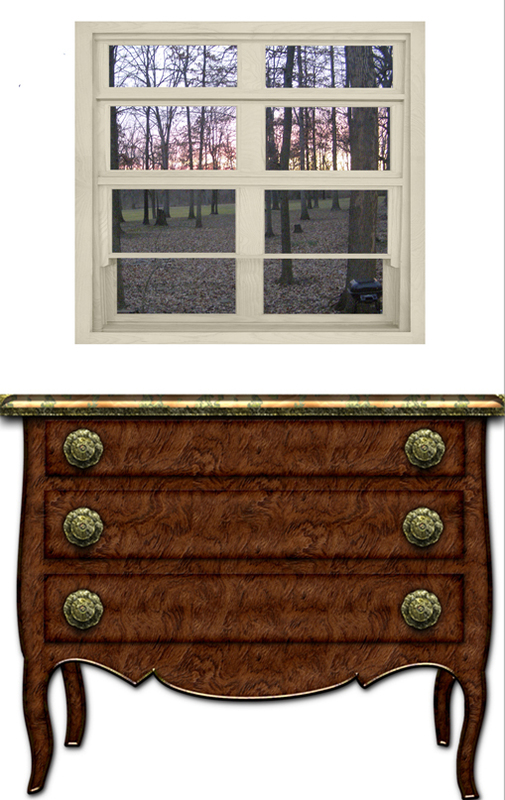 Using ScrapSimple Tools – Styles: Wooden, I created the wood grain for dresser. When I was satisfied with the way the dresser looked, I printed it out on white card stock (SAVE document for later use!) then cut out. At this time, I decided to draw and paint the background in my art journal. Taking the cut out dresser, I placed it on my journal page where it would eventually be glued in. I wanted the dresser to look like it was against a wall. To do this, I drew a light pencil line just above where the back legs were on the page. 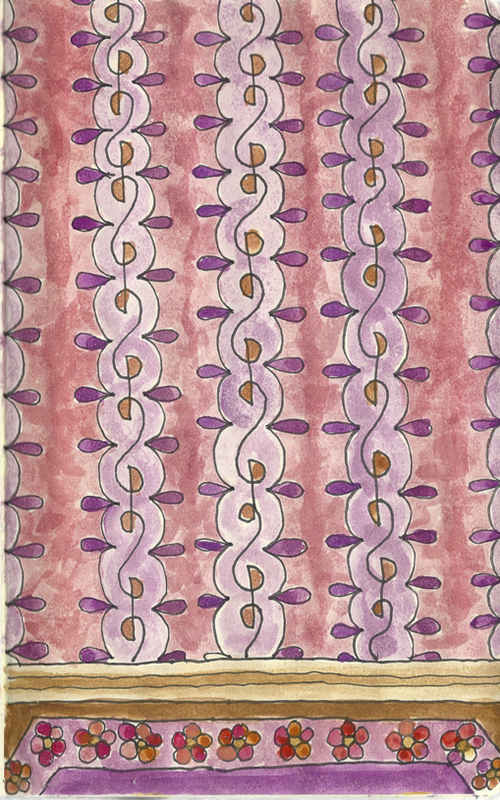 I sketched the wallpaper design and the carpet. Then used water color pencils and a water brush to finish. 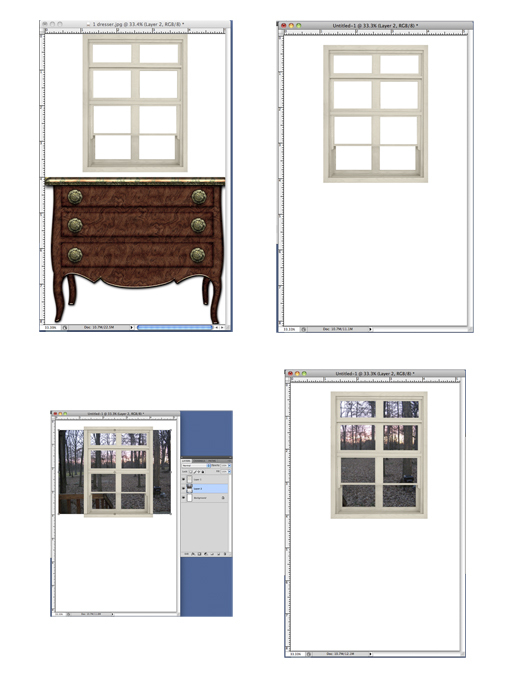 I created the window and view next. I selected a window from my stash and opened my saved dresser document. 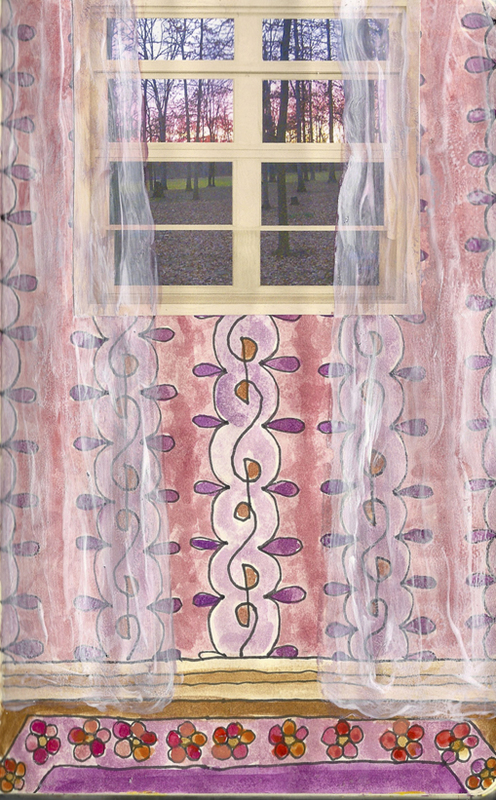 I then created a new layer and named it window. 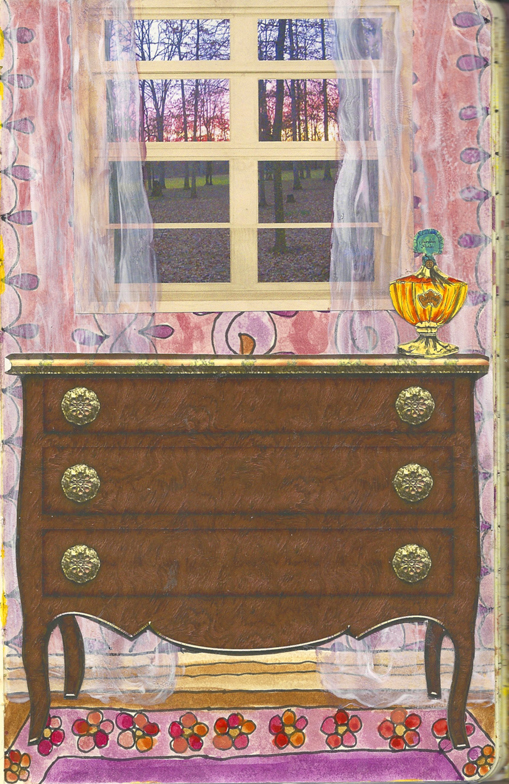 Then I copied and brought the window over, sized and centered it over the dresser. 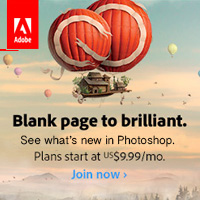 I clicked the eye next to the background layer to turn it off. I then selected a photo of my backyard, brought it over, sized it to scale, then dragged it under the window layer. I clicked on create clipping mask to finish. 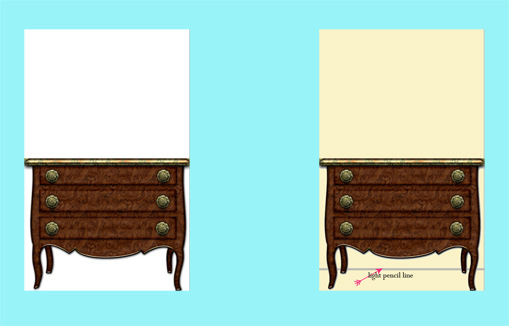 To check how it looks with the dresser, just click on the background layer eye to turn it back on. Print just the window view on card stock and cut out. By this time your watercolor should be totally dry. Glue the window view to your journal page. 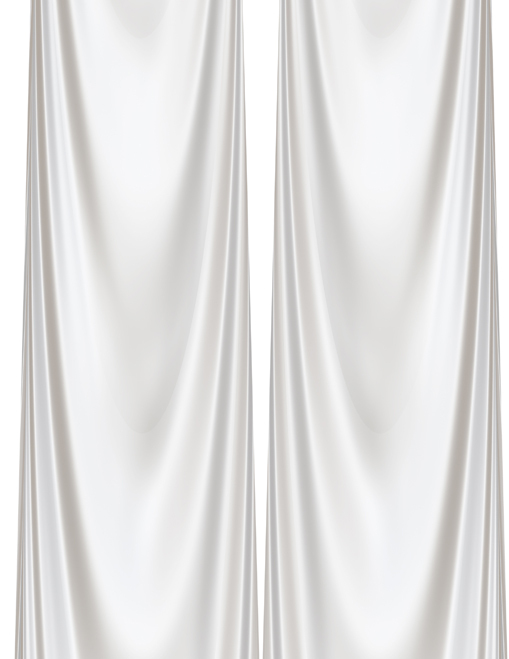 Now it’s time to create the curtains. I used the curtain from the Ballard Collection Biggie and sized it to my journal page. I then duplicated it and flipped the duplicate. I printed them out on Sheer Heaven. I then transferred them to my journal page. They transferred very light so I decided to accent them by brushing on a layer of white acrylic paint mixed with Golden’s gloss gel medium (to preserve the transparency). Let it thoroughly dry, then glue on the dresser. OOPS!!!! I almost forgot the perfume. I scrap lifted the bottle and sized it to be in scale with the dresser, printed it on card stock, cut, and glued it on. This is one of my most favorite art journal pages ever! Have fun with this technique and PLEASE post your results on the Scrap Girls Hybrid Gallery!